Like the cobbler who can’t find the time to fix his own shoes, we have not made a major update to our website since our founding in 2008, and we are happy to announce a new design. New features include product and presentation pages, updated resources, and various user interface (UI) upgrades to help you use the site better. We are open to your feedback and requested features. Through the process of implementing some great features to our WordPress backend, updating our content, and in seeing some of the changes we’ve seen to Twitter and Google Reader this week, we’re pensive about the direction of online and social media tools. Below are some thoughts on benefiting from new tools and ideas while mitigating the associated risk. In 2008, WordPress was not often used for company websites, if you can believe it. I had to do a few web searches to find examples of people using it for this purpose. I am very happy with the choice and benefit greatly from the thousands of developers who write themes and plugins. Small companies now have so many opportunities to develop web applications. 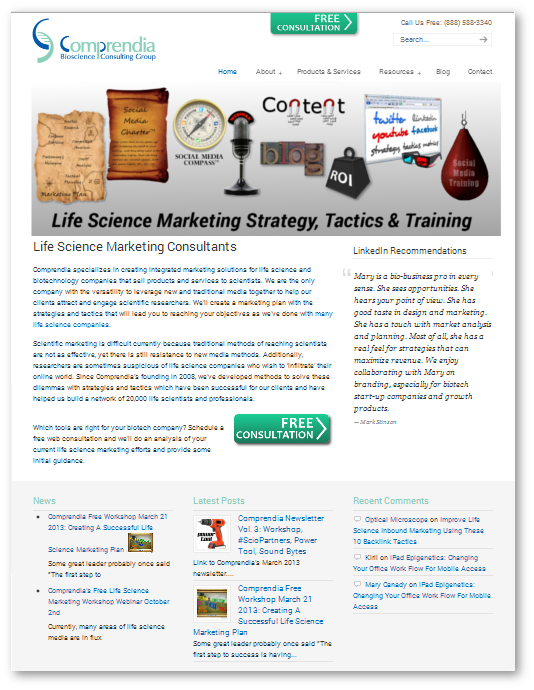 In 2008 I had a vision of connecting life science professionals in a few different ways, and started groups on LinkedIn and Ning (a DIY Facebook around a topic). The LinkedIn groups took off while the Ning group did not. The latter took too much upkeep and people did not necessarily want to create a new login. I am very grateful to LinkedIn for the opportunity to build a network of ~12,000 life science professionals, but it does have many limitations and we could lose control at any time. The restrictions on the Twitter API and the shut down of Google Reader underline the dangers of relying on these free applications. It makes sense—we live in a capitalist society, applications cannot be provided for free, indefinitely. Where does this leave us? Let me give you two examples. In 2008 when I started Comprendia, I used a free WordPress template and spent a lot of time modifying it. In 2013, we bought a fantastic WordPress template and realized the benefits immediately. For RSS, we’ve been using Google Reader and Feedburner, and I hear rumors that the latter will be discontinued too. In their place, we’re considering either paying for a WordPress plugin or a service such as FeedBlitz. Many web applications relating to web 2.0 and social media have matured to the point where they are now worth paying for, even if it’s just a small donation. If you feel uneasy about using an application because it gives you too little control, always look for ways to take control. Don’t forget that applications such as Facebook are feeling the ‘capitalist crunch’ too, and you should endeavor to capture leads from your pages. As online media continues to shift, you need to position your company to leverage the changes which will benefit you, and supporting useful tools goes a long way too. There are now myriad web developers who can easily customize applications for you to build engagement and get leads. Comprendia is considering revisiting the idea of connecting life science professionals using our own tools, stay tuned for updates. For now, I suggest you look at your own web and marketing efforts to evaluate risks and opportunities. Your site is looking very nice! I really like this site; I think it is a big improvement and the user experience is cleaner!